Gold, frankincense and myrrh are perhaps the most famous gifts ever given, brought by the wise men to the newborn baby Jesus. Frankincense has been in used even since ancient biblical days, when Moses used it as part of the holy anointing oil on the Ark of the Covenant and in the sacred temple. A gift fit for the King! Frankincense comes from the Boswellia tree that is native to the southern Arabian peninsular and parts of India. There are different varieties of the Boswellia trees, but most essential oils are extracted from the Boswellia carterii species (a.k.a. Boswellia sacra). Other varieties include Boswellia frereana and Boswellia serrata. Frankincense—also sometimes referred to by its Hebrew name, olibanum—is used in the form of essential oil in aromatherapy that offers a great variety of health benefits. It has been reported to potentially be able to fight cancer. For thousands of years, frankincense has been used for more than just an anointing oil. Ancient physicians use this essential oil to remedy various medical ailments. Today, frankincense is used for many modern diseases and ailments. According to the book, “Reference Guide for Essential Oils,” by Connie and Alan Higley, monoterpenes (one of the most valuable elements of frankincense essential oil) help prevent and discharge toxins from your liver and kidneys, and have antiseptic, antibacterial, stimulating, analgesic (weak) and expectorant properties. Frankincense essential oil may be a lady’s best friend. It is beneficial for balancing hormones when you are experiencing symptoms with menstruation or menopause. It helps to regulate estrogen production and reducing symptoms of hormone-related problems such as fibroids and cysts formation, headache, anxiety, fatigue, mood swings and cramps. If you have any symptoms at all, it is a sign of a poor immunity and frankincense can significantly strengthen your immune system. Taking the oil internally helps your body to produce white blood cells (your body’s defence system) to fight against any infections; and by greatly reducing inflammation that are causing the pain in the body. Scientists at Cardiff University believe that treatment with an extract of Boswellia frereana inhibits the production of key inflammatory molecules which help prevent the breakdown of the cartilage tissue which causes arthritis and rheumatoid arthritis. This means that it may also be beneficial for relieving inflammatory conditions such as asthma, gout and IBD (inflammatory bowel disease). The frankincense essential oil helps to soothe cough and break-up phlegm deposited in the respiratory tracts and the lungs, for elimination. As an anti-inflammatory, it helps to relax the breathing passages and reduces asthma attacks, relieves bronchitis and chest congestion. Put a few drops into a diffuser or vaporiser to help clear the airways and lungs. Add some frankincense essential oil to a diffuser or a vaporizer when you are feeling anxious or stressed. It helps to lower your anxiety, stress, anger and dispel negative emotions, while promoting peace, relaxation and calmness. It provides an overall feeling of wellness and help you to be more focus and alert. This gentle oil is powerful in aiding the digestive health by eliminating gas in the gastrointestines to stop bloating and intestinal spasms. It helps improve the secretion of stomach acid and bile for better digestion, stimulates the intestinal peristaltic muscles to move digested food along through the intestines and preventing constipation. As an antiseptic, the frankincense essential oil is excellent for speeding up wound healing. Apply a drop or two of this oil with a carrier oil on your wound to protect it from infections. This is especially helpful if your wound tends to take a longer time to heal, as in the case of individuals with diabetes or other blood disorder. When taken internally, it is also beneficial for healing internal wounds and ulcers. Frankincense works at cellular level to rejuvenate and regenerate cells, making them like new. It is one of the best essential oils to be used on old scars of surgery, wart removal or acne. It is also beneficial for fading out stretch marks associated with weight gain and pregnancy. Apply a few drops to a carrier oil, and apply it on your scar—gently massaging it into the skin to break up scar tissue. The dry winter air can cause your skin to be very dry and cracking. Add a couple drops of frankincense oil to your lotion to rehydrate and rejuvenate the skin. Also put a drop of the oil on your nail and rub it around the cuticles and edges of your fingernails to leave them looking healthy and strong. 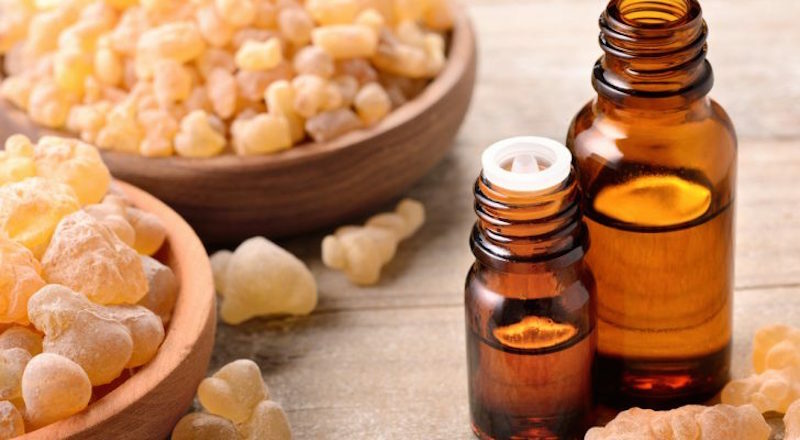 A research by the University of Leicester has suggested that the potent anti-inflammatory properties of frankincense oil may be more powerful than previously suspected. They found that this oil contains a unique compound known as acetyl-11-keto-beta-boswellic acid (AKBA for short) that they uncover is a great enemy of cancerous cells, and effective for therapeutic use on women suffering from ovarian cancer. Related research into AKBA has shown that this unique compound is also effective against other forms of cancer including breast, colon and prostate. Evidence suggests that frankincense is not just a supplemental treatment alongside chemotherapy and radiation; in some cases it may actually be the preferred replacement for cancer treatment! By applying it on the skin to be absorbed. It is usually mixed with a carrier oil, such as the jojoba oil, coconut oil or olive oil. By putting drops under your tongue or add drops to your drinking water. Always follow instructions on the recommended dosage. The oil is so concentrated that only a little is required. When looking to buy essential oils, look for oils that say “pure essential oil” or “100% essential oil”. A high quality brand is always recommended over the cheaper ones that you buy off the shelves. Avoid oils that say “fragrance” or “perfume” as these are not pure and are not suitable to be used for any health benefits.